What hasn’t been written about the Goodwood Revival in the twenty years since its inception could probably fill an entire postage stamp. An event practically demanding the invention of ever more superlatives (so here goes), it is Motor Racing elevated to the level of Grand Theatre, a slice of cohesion so perfect that it couldn’t possibly occur without concerted, dedicated effort. Not so much Period Correct, as Period Amplified. Suffice to say, it was ever more perfect than reality - and still is. Dodging the inclement conditions of last year (and indeed, this year’s Members Meeting), the Chichester circuit presented itself according to Roy Salvadori’s famous quote, and it is hard to think of anywhere more agreeable to be. Proudly boasting of the “world’s most expensive race” this year, Friday evening’s Kinrara Trophy - rapidly becoming the true headline act of the event - saw well north of $250m battle hard into a glorious sunset. That the win was taken by one of the meeting’s true beaus (2819GT - the 250 GTO Breadvan) only served to reinforce a sense of laughable brilliance at everything unfolding before your eyes. Yet, for all of the warm, tangerine sunshine and jewel-like nature of the illustrious grid, the true beauty of this - and all the races - is to witness these cars being driven, and raced, to their absolute limit, on a circuit which demands nothing less than near-permanent four wheel drifts. Madgwick and Fordwater corners alone have around seven apexes between them, and in the hands of those as skilful as Pirro, Franchitti, Lotterer, Dumas and old hands like Attwood and Bell, the cars practically dance around the track with nothing held in reserve. Sporting both professional drivers and replica/race engines, many are probably pushed harder than they ever were - but isn’t that in keeping with the ‘even better than in period’ vibe? Of course, there’s more to this than racing, and it’d be a waste of every attendee’s efforts to dress themselves if there were nothing else to do. Themed Cinema? Check. Toy Emporium? Check. Champagne bar? Live dancing? Wall of Death? Seaside beach with ice cream? Fashion show? Styling salon? Cigar vendor? Air show? Every year. Heavens, this year they even built a farm. Character actors outnumber racing drivers easily, yet most of the time you’d be hard pressed to distinguish them from any paying guest sporting their Sunday best - smiles are equally broad wherever you look. It’s just that kind of event. 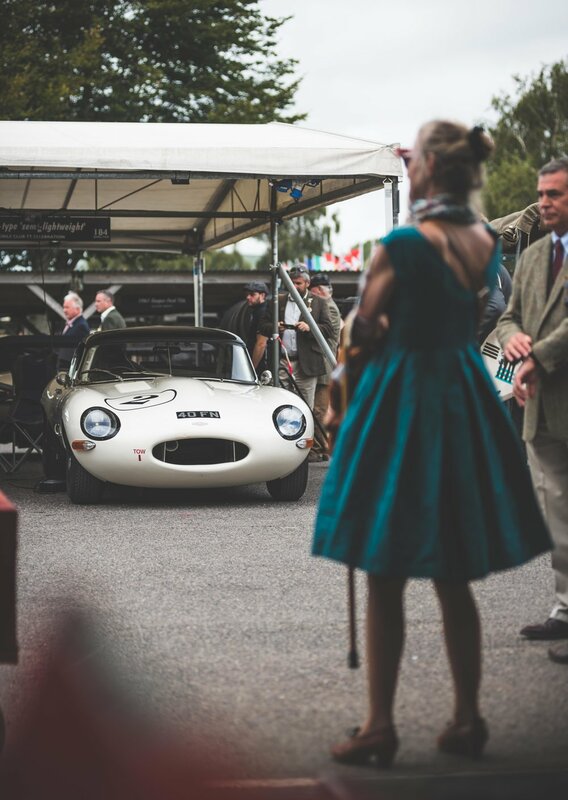 Give me Goodwood on a summer’s day, and indeed - you really can keep the rest.